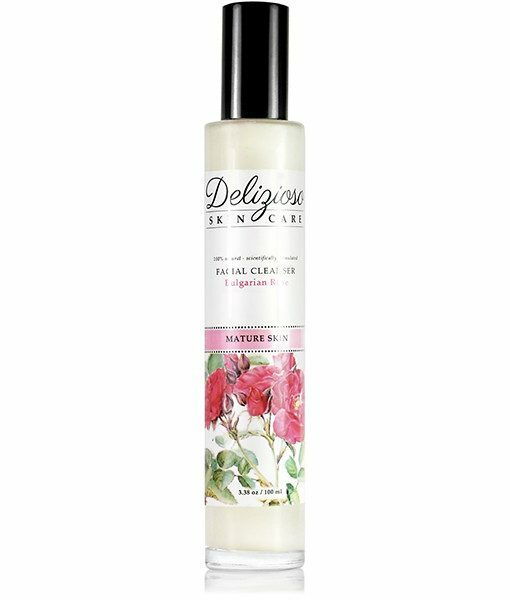 This 100% natural luxurious facial cleanser is enriched with pure preciously distilled Bulgarian Rose oil that is known to make skin appear younger and smoother. Classically Romantic and beautifully fragrant, the rose flower yields a precious oil brimming with nutrients that naturally indulges skin and stimulate the senses. The gentle soap free formula helps rid of impurities and cleanses skin without any synthetic or harsh additives. The nourishing blend leaves skin feeling more soft and supple. Using fingertips, gently massage onto face, then rinse and pat dry. Use morning and evening. 3.38 oz / 100 ml – or Travel Size 0.5 oz / 15 ml . *Aloe Barbadensis Leaf (Aloe) Juice, Xanthan Gum, *Rosa Damscena (Bulgarian Rose) Hydrolate, *Cocos Nucifera (Saponified Coconut Oil), *Ribes Nigrum (Black Currant) oil, *Passiflora incarnata (Passion Flower) oil, Rosa Rubiginosa (Rose Hip) Seed Oil, Tocopherol (Rice derived non GMO Vitamin E), *Rosa Damscena (Bulgarian Rose) Essential Oil, Pheonix Dactylifera (Date) Kernel Extract, Lycopene Extract and Natural Antioxidant Preservative (Vitis Vinifera (Grape) Seed Extract, Populus Tremuloides Bark Extract, Leuconostoc/Radish Root Ferment Filtrate, Sambucus Nigra (Elder) Fruit Extract). PASSION FLOWER OIL: This oil is the absolute gold standard of oils. The natural liquid targets all skin concerns and results in firmer, brighter, smoother-looking skin. This powerful anti-aging oil provides instant hydration-quenching dry skin with no greasy or filmy feel.